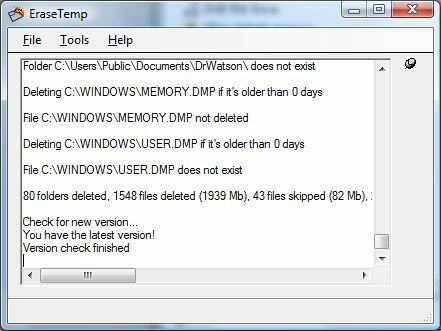 EraseTemp is a utility that automatically deletes old temporary files from your computer. If you just run the application it deletes everything older than one day in the Temp folder(s). It looks in your personal Temp folder in Documents and Settings and the Temp folder in the Windows folder. It also removes old dump files by default. You can also use EraseTemp to delete old files, any number of days old, in any folder.